"If we ignore pennies under the assumption that a penny is worthless and won't make a difference... how much more of a grave mistake is it to do the same to children? How often do we do this to the world's children? How often do we do this to our own?" Will you join me there to hear about my Penny Perspective? A year ago, I did not know what the word emancipation was. A year ago, I might have passed this book when it was offered for review. I would have missed out on one of the best books I have ever read. Although I had read many books on slavery and human trafficking, this true story of a child slave drew me in for three reasons. 1. It focused on child slavery in the U.S. after the Emancipation Proclamation of 1863. This was the first book of it's kind that I would have read to help me in my abolishment advocacy. 2. It was split into three definite sections -- Slavery, Freedom, Ministry. This implied that there would be much to learn as we followed Mr. Sadler's story from beginning to the eternal rest. 3. Richard and the millions of children like him, still awaiting freedom. I close my eyes, and I see him... I owe it to him to continue to equip myself with knowledge. I must say, if it hadn't been for the flawless way this book was written, it would have been a story almost too hard to bear on the heels of our time in Ghana. There are times when I felt physically sick and I could feel my heart bruise deeply for the injustice and pain inflicted upon these innocent, precious lives not only in the south, but everywhere that slavery has tainted mankind. 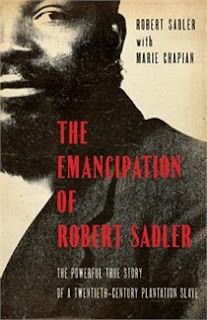 The writing was exquisite and did the story full justice in as much as a book can.You could literally feel yourself living Robert Sadler's experiences alongside of him as he painted the brutally vivid picture of his journey through slavery from the age of 5, to freedom, and then ministry. As much as it was important to me to read about his life as a child slave and the realities of what life was like for not only him, but all those who served with their lives alongside of him, it was his later years that touched me the most. The pain of the loss this world suffered at the passing of one of the most exceptional examples of Christ who had ever walked on American soil, and the finest example of a human diamond, born of extreme pressure and trials turned into beautiful and shining glory for God. Easily in my top 5 favorite non fiction books, ever. I strongly believe that this book needs to be read by all -- and as such, I would like to donate my copy of this book to one of my blog reader. Simply leave a comment sharing how slavery has impacted your life, how you would benefit from this book, and how I can contact you if you are the winner. Draw will be made Wednesday, February 8th at 11pm EST. "Book has been provided courtesy of Baker Publishing Group and Graf-Martin Communications, Inc. Available at your favourite bookseller from Bethany House, a division of Baker Publishing Group". Back in early November, I learned that I had been awarded with a trip to Cameroon to join a team building four schools in remote valleys of Cameroon. I had misunderstood the nature of the award -- it was a subsidy, not a sponsorship. The airfare is fully funded, the project is fully funded, but I must fundraiser to provide for my in-country expenses and travel visa document. Estimated cost for 2 weeks is $800, including travel visa document. Since there are only 17 days left before I leave, there is little time to fundraise. I have decided to do a Back-To-Africa Photography Sale/Fundraiser. Check out the Facebook Album where the photographs (and one photo session) are available for sale. Limited quantities. It has been a while since New Year Resolutions changed meaning for me, growing cold, buried deeply right next to life's "Bucket List". Oh it's not that I haven't given them a voice in the past, those handful of things that I had hoped for past years, or wanted to do in the eventual future... I just can't recall what they were, since they have completely lost their importance to me. When I first heard of it, the idea appealed to me. Tossing aside the New Year Resolution and choosing instead one theme, one word to focus on throughout the year, either something we pray for more of, something we're weak at and want to focus on improving... or perhaps something chosen for entirely different reasons. My word for 2011 was Outrun. It meant so many different things, on so many different levels, and I much enjoyed the process of not only choosing the word (and just ONE word), but of living it out. 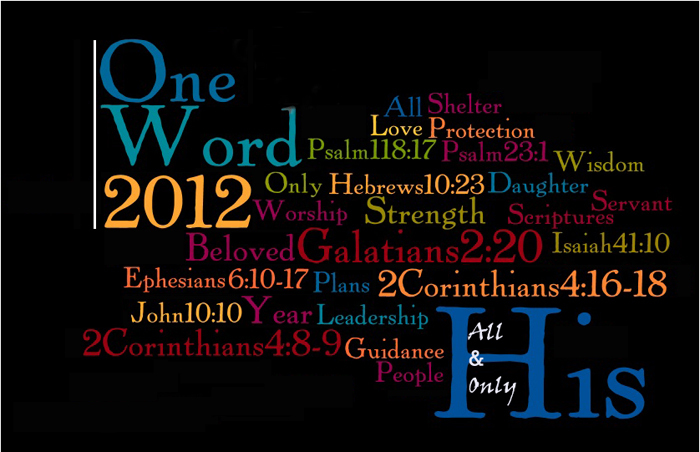 The time came to decide whether or not I would choose a word for 2012. I found myself reflecting seriously on it as 2011 ended in a season of upheaval and 2012 was ushered in with continued determination to outrun the enemy's increased pursuit, and the one and only word that came to mind through all the reflections was a word that I believe may very well be my last "One Word" of the year. It's a word that will never change or lose meaning, regardless of where my life leads or what the years ahead hold. Every year is His, since I am His. Always. The plans for me are His. It is His daily bread that is sufficient. My life is in His hands. It is through His death that I will live. I have been crucified with Christ and I no longer live, but Christ lives in me. The life I now live in the body, I live by faith in the Son of God, who loved me and gave Himself for me -- my life is completely His. For none of us lives to himself alone and none of us dies to himself alone. If we live, we live to the Lord; and if we die, we die to the Lord. So, whether we live or die, we belong to the Lord -- we are His. The Lord makes firm the steps of the one who delights in Him; though he may stumble, he will not fall, for the Lord upholds him with His hand -- those who are His. The Lord is my shepherd, I lack nothing -- because I am His. Therefore, I will not lose heart... though outwardly I am wasting away, yet inwardly I am being renewed day by day. For my light and momentary troubles are achieving for me an eternal glory that far outweighs everything... so I fix my eyes not on what is seen, but what is unseen, since what is seen is temporary, but what is unseen is eternal... my days, my years, my heart, my life, my love, my everything... all and only His.